Effect: You announce that you will give a demonstration of shuffle tracking but that you will go even further than normal and actually track cards in a deck which is mixed face up and face down. The deck is very fairly mixed this way a number of times then you decide to take it even further and have the spectator remember one of the cards from within the chaotic mess you've made of the deck. With this done you FAIRLY FAN THE DECK TOWARDS THE SPECTATORS - IT IS SEEN TO BE GENUINELY MIXED FACE UP INTO FACE DOWN. You even give it one final weave - just to be sure. Now, with no corrective manouvers whatsoever, the four Aces are suddenly produced - you have succesfully 'shuffle tracked' the four strongest cards in the pack! Finally, you spread the cards to show that you've also righted the entire deck. Every card is facing the same way exept for the card they're thinking of and it's three mates. Dave has kept The Forrest Triumph under wraps for years. It has only seen the light of day in front of lay people and a few select magician friends - all of whom have been very positive about the method - in particular the incredibly fair 'fan display' of face up and face down cards. This incredible card effect has been tweaked and honed over time into a stunning performance piece that can now, finally be yours. Every detail, every sleight and nuance including all the presentation points that help make the effect engaging and utterly impossible are taught in full detail. Drag your next audience kicking and screaming into disbelief and annoy your magician buddies while you're at it. 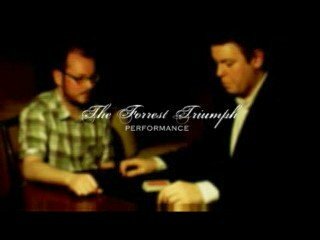 The Forrest Triumph can't fail to impress.